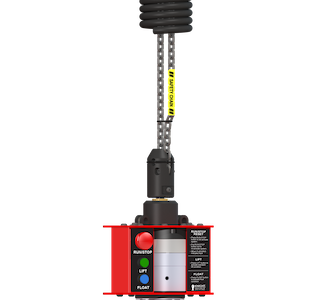 Knight is leading the industry with its next-generation KSHS Safety Drop Stop Servo Hoist series (Patent No. 10,099,904) – the safest, most intelligent hoist in the world. 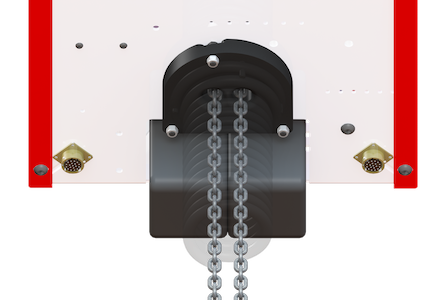 The KSHS Series includes our patent-pending “Safety Drop Stop” (SDS) feature and has redundant chains – one that carries the load and another that travels along for safety. This series has added features to its Intelligent Assist Device (IAD) that give the operator improved precision to locate or float a load in the “Z” direction (vertical axis). Our KSHS Series allows for many application solutions due to its various programmable features and unlimited I/O. 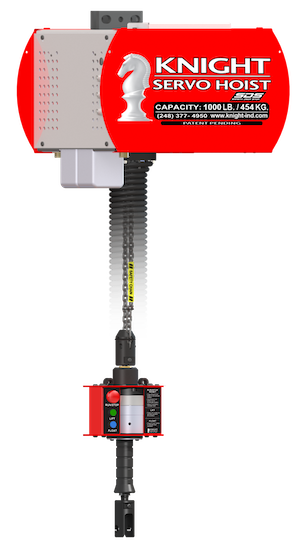 Unlike traditional hoists that require the operator to push buttons, our SDS Servo Hoist enables an operator to simply grasp the handle and move the load, eliminating push buttons altogether. Knight’s Servo Hoist technology becomes an extension of an operator’s natural movements and greatly improves accuracy, responsiveness and repeatability; which increases overall safety, productivity and quality. The inherent benefits include: eliminating wasted motions, reduced reaction times, and minimal effects of inertia on heavy loads. Load Chain: Carries the load. Safety Chain: Rides along for redundancy and safety. Chain Length, Unlimited (12-18 ft. Standard). STO – Safe Torque Off. Programming and Diagnostic Communication Port. Enable trigger, for quicker response. (4) Analog Inputs/ (4) Analog Outputs. (24) Inputs or Outputs, configurable. LED Status Indicators: Green and Blue Lighted Push buttons. LED Fault Indicators: Illuminated Red Run-Stop Button, Twist to Release. Optional Remote Pendant or Wireless Remote Control.